French artist Poussin often turned to the themes of mythology. In Rome, an outstanding work was written with the philosophical title “Dance to the Music of Time”. The approximate time of creation of the grand canvass is 1638. The ancient myths formed the basis of the painting by Nicolas Poussin. As the founder of classicism, the artist reflected the new style in this work. In the picture everything is beautiful, harmonious, perfect. The figures of mythical creatures and people are endowed with ideal proportions. The surrounding architecture is beautiful and elegant. Nature delights with sophistication and natural splendor. In the composition center there are 4 figures dancing in a closed circle. The first symbolizes Poverty – a barefoot young man in a dark robe. To the right his hand is held by Labor, then by Wealth. The red-haired girl with a sly smile closes the cycle of dance – a symbol of Delight. Such an allegorical round dance can be understood as the rotation of the wheel of Fortune. Under the influence of a fleeting event and the prevailing circumstances of life, a person receives one of the four named states. The other figures in the picture are two babies. One sits to the left, playing with soap bubbles. This is another symbolic image, reminiscent of the transience of life. On the right, the baby watches the movement of the hourglass, which he holds in his hand. The winged elder Chronos is the embodiment of Time itself. He plays music to which dance is dancing. The statue with two faces – the god Janus. A young face directs his gaze to the future, the second head of a bearded old man looks in the opposite direction – into the past. The painter placed a mythical object on the sky – the chariot of Apollo. In front of her, the goddess Aurora flies and sprinkles flowers. 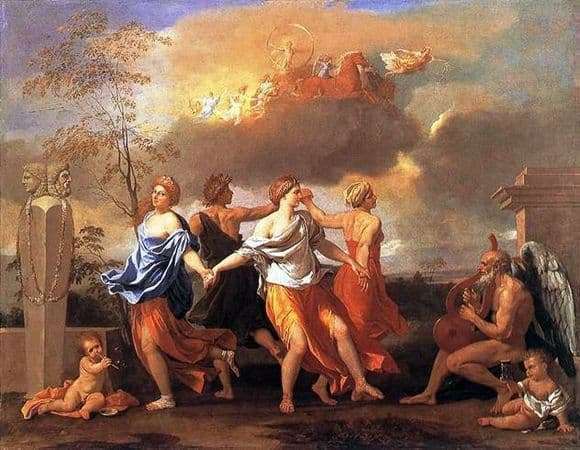 Poussin has displayed in the “Dance to the Music of Time” an allegory of human life. The masterpiece is now in London in the Wallace collection.